What do bees need in the way of plants? First of all, we have to understand that bees use plants for nectar and pollen. They gather nectar to bring back and turn it into honey and they eat that honey. They also bring back pollen, which they use as a food source and they use that to feed their young bee larvae. What do the bees bring back? Pollen is available on practically all of the plants. Some pollen the bees like really well, other pollen they don’t. It just depends on what they prefer and they’ll go after what they want. Same thing with the nectar, they’ll go after what they want. You can plant a huge field of clover right out in front of your hive and sometimes they’ll ignore that and go after a source of nectar that they like better. There’s nectar on everything, so you have to look at everything, not just what is growing in the grass. If you think they’re going to go after a certain type of flower, they may not go after that because there may be a tree nearby that is absolutely huge and is just loaded with flowers 60, 70, 80 feet in the air. You have to look around and see what is blooming. Many trees bloom and they give abundant sources of nectar and pollen for the bees. To go over some of those plants, we’ll just mention a few today. Some of these are trees, some of these are bushes, and some of them are common weeds. 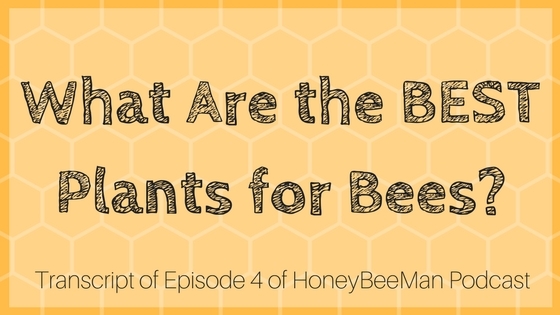 We’ll just go over some of the main plant sources that bees like. One of the things that is very common is alfalfa. It’s grown on farms for hay for cattle and that type of thing. It’s a very good honey plant. It has nectar and pollen both. There are various forms of clover. There’s white clover, yellow clover, Dutch clover, etcetera. Many of these clover types are very good for bees. One of the best ones is white dutch clover; that’s a very good plant for honeybees with both nectar and pollen. One of the things about clover, many people in subdivisions spend thousands of dollars getting rid of clover when in fact that’s a good beneficial honeybee plant. You hate to see all of these clovers being sprayed with chemicals and then the honeybees have nothing to eat. It’s a shame. It would be nice if neighborhood associations would plant an area full of clover, such as their drainage basins, and then they don’t have to pay thousands of dollars for mowing services to come and mow this property all summer long. It actually could save thousands of dollars by planting beneficial plants like clover in areas where the bees can benefit and it also has a benefit to the home owners as well where they don’t have to pay mowing services to mow this land. That’s a little cost saving tip from The HoneyBee Man. Hopefully you can use that in your own neighborhood or if you are maintaining industrial property that may be an option for you. I’ve often thought of the ideal places for clover where you don’t have to mow, areas like around water towers where typically the counties and cities would have to hire a mowing service to maintain that land every two or three weeks. Electrical substations would be another ideal place where you could plant clover and let it go. I actually have some acreage of land where I’m going to put some clover in. The key is that those bees probably won’t go after that clover. They’ll find something that they want more than that clover. It just depends. They’ll go after what they want and they’ll find the nectar and pollen that they need. Just because you have a beautiful garden doesn’t necessarily mean you’re going to get to see the beautiful bees. You may be see bumblebees and wasps, and you may not attract the honeybees that you really want to have. When they need that certain nectar source, they’re going to come and get it. But don’t be too surprised if they hang out somewhere else and don’t come visit your garden. They may just have some other nectar sources that they want to come to. For some other plants, there are many trees. Apple trees are one of the best, with both nectar and pollen. Black locust, blackberry plants, cattail. One of the things most people don’t have around much anymore is catnip. It kind of looks like a weed, it will take over if it’s not contained. It’s kind of like a mint. It has nectar on it that they go after and they really like that. Cucumber in your garden have both nectar and pollen. They rarely supply surplus honey, but if you don’t have honeybees around it’s pretty tough to grow cucumbers. They get oblong shaped, they’re fat on one end and pointy on the other if they’re not pollinated. Things like that you have to have the pollination. We talked about that in a previous episode. Lavender is another good plant. There are hundreds of plants. This information is commonly available on the internet as well. You can Google search for honeybee plants and you’ll find this information. Melons are another one. We talked about watermelon. Cantaloupe, you’ll get some surplus honey off of that if you have a hive nearby. Oregano is an odd one. Pear. Persimmon. Pine trees. Pussywillow. Raspberry. Sassafras. Soy beans have some nectar, not really much in the way of surplus but sometimes in some places. All of your clover plants. Yellow poplar. There are lots of trees that put off some huge blossoms. Redbud. Red Maple. Tulip poplar. Honeysuckle. Some of your shrubs put off a flower. Sunflower is really good for pollen, but it rarely has much in the way of nectar. Of course, milkweed. There are some plants that I’ve never even heard of. If a plant expert was to talk about this, they would probably know more than I would. In the Fall one of the plants is goldenrod. There is goldenrod, iron weed. Goldenrod is pretty common in the midwest and pretty much thought of as a weed and it grows along the sides of the country roads. It’s a yellow flower that is very abundant, so you’ll see that as you drive in the Fall. Goldenrod has a distinctive smell when the bees bring it back to the hive, it stinks pretty bad around the hive. But then it makes wonderful honey. It makes kind of a darker honey, not quite like a buckwheat honey but it’s a lot darker than your springtime honey. There are many plants you can have. One of the best things you can do for honey plants is buy your plants from a nursery, and the ideal time to see what bees really like is go in the Fall when the plant stores and nurseries are trying to get rid of a lot of their things and a lot of times they’ll have big sales. That’s an ideal time to go shopping for additional plants because you can see the bees on the plants for nectar, they’re going after these plants. What you can do at a plant nursery is walk down through the aisles and see where the bees are gathering. If you see a certain plant sitting there, count how many bees are on it. Go to the next plant and count how many bees are on that. If you see one plant that has 10 bees on it, you see another plant that has two bees on it, and you want to have a nice garden that attracts the honeybees, then go ahead and buy the plant that has the 10 bees on it and you know that you’re going to have a plant that the bees love. That’s one thing I like to do and that’s an easy way to do a little check, just go to a nursery in the Fall and see where the bees are at. The bees will be on those plants, especially in the Fall when the bees are hungry they’ll be checking out all of those nectar sources and that’s an excellent time to get a hold of some of those plants that have nectar available. That’s about it. Like I said, this information is available on the internet. It’s pretty common, a lot of the university sites will have very detailed information on this. You could actually print out one of these lists. If you go to a university in the state where you live you can print out a list in your area and then you can find out what grows good in your area and what the honeybees like. These lists can be very helpful and you can take that to your nursery and find the plant that you like and find one that fits in your garden that you’d like to have. Hopefully this short lesson has given you some assistance on what kind of plants you’d like to go after. I know it’s not inclusive of everything, but it’s a little bit about some of the plants available. Hopefully that will help.